Cite this podcast as: Morgenstern, J, Spiegel, R, Helman, A. Part 2 Endovascular Therapy for Stroke. Emergency Medicine Cases. July, 2016. https://emergencymedicinecases.com/endovascular-therapy-stroke/. Accessed [date]. A very small percentage of patients with acute stroke (about 1%) will be eligible for endovascular therapy. Most of the trials listed above enrolled patients with anterior circulation large vessel severe strokes that have demonstrable salvageable brain tissue on imaging. The bigger question is whether the small benefits of endovascular therapy to a very small number of patients is worth the larger societal costs of interventional radiologists on call, equipment, administration etc. for “code stroke” to be called at any time of day. Broderick JP et al. Endovascular Therapy After Intravenous t-PA Versus t-PA Alone for Stroke. NEJM 2013; 368(10): 893-903. Kidwell CS et al. A Trial of Imaging Selection and Endovascular Treatment for Ischemic Stroke. NEJM 2013; 368(10): 914-23. Ciccone A et al. Endovascular Treatment for Acute Ischemic Stroke. NEJM 2013; 368(10): 904-13. Fransen PS et al. A Randomized Trial of Intraarterial Treatment for Acute Ischemic Stroke. NEJM 2015; 372(1): 11-20. Goyal M et al. Randomized Assessment of rapid Endovascular Treatment of Ischemic Stroke. NEJM 2015; 372(11): 1019-30. Campbell BC et al. Endovascular Therapy for ISchemic Stroke with Perfusion-Imaging Selection. NEJM 2015; 372(11): 1009-18. Saver JL et al. Stent-Retriever Thrombectomy after Intravenous t-PA vs t-PA Alone in Stroke. NEJM 2015; 372(24): 2285-95. Jovin TG et al. Thrombectomy Within 8 Hours After Symptom Onset in Ischemic Stroke. NEJM 2015; 372(24): 2296-306. Bracard S, Ducrocq X, Mas JL, et al. Mechanical thrombectomy after intravenous alteplase versus alteplase alone after stroke (THRACE): a randomised controlled trial. Lancet Neurol. 2016;15(11):1138-47. Mocco J et al. Aspiration Thrombectomy After Intravenous Alteplase Versus Intravenous Alteplase Alone. Stroke. 2016;47(9):2331-8. 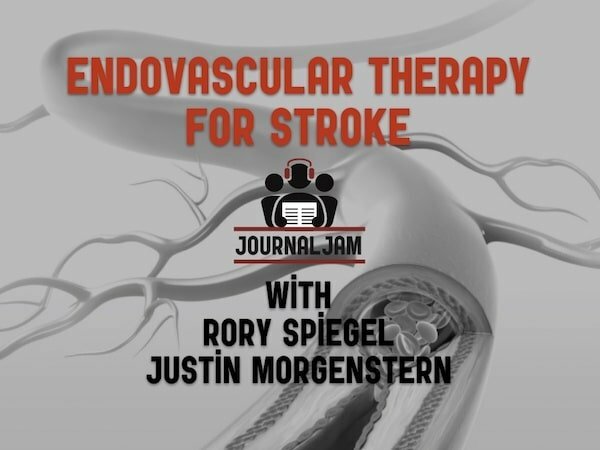 EMDocs Endovascular Stroke Therapy: Is this the new standard? Hi there, I’m a ground paramedic, and I found this series on tPA and EVT incrediblely informative, especially since I give TNK in the field to STEMI patients a couple of times a year and was completely sold on the idea that fibrinolytics in CVA would have similar effects. My practice unfortunately can’t change, but I think having this information will make me a better patient advocate as our code stroke guys definitely don’t seem to have a discussion about tPA and consider it standard of care, so I can give the family & patient better information during the transport to hospital. I’m interested in your thoughts on what we’re now doing in Alberta with EVT. In your podcast you suggest that there would need to be a significant system change to capture the right patients that would benefit from EVT, and it appears that we maybe have accomplished that. Pre-hospital we now incorporate a LAMS score assessment & any patient >/= 4 on the scale /=4 indicates large vessels occlusion and EVT will benefit the patient, and that by moving to this we’ll be capturing approximately 400 patients a year. Do you think the data supports going this widespread with this? I thought your comment on taking the ambulance out of the community to support this was interesting considering the mixed evidence and if you think that supporting something like this provincially could actually cause harm as those ambulances are no longer available. Secondly, regarding endovascular therapy: while I sympathize with the hope that EVT could offer some benefit, I remain far more skeptical, as we have seen this same process fail in the orthopedic literature. In addition to the unfortunate similarities to the original tPa literature that you mentioned, there are also similarities to the orthopedic literature on arthroscopic surgery for meniscal injuries. We once considered arthroscopic lavage or debridement beneficial for meniscal injuries – and we noted significant improvement after these surgeries – until two blinded studies demonstrated that simply sedating the patient and making two nicks in the skin over their knee demonstrated the same improvement. I suspect that we are seeing the same narrative played out in the neurological literature now. We have abundant literature demonstrating the powerful effect of placebo, and what better placebo could you get than a wound to remind you that the medical system really tried hard to help you?